Happy Easter! 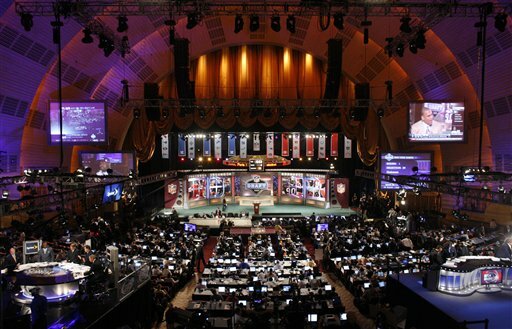 You know what that means... Day 11 of the SKOHRboard & Stangs League 2011 NFL Mock Draft! Today we'll get four total picks and three of them are from internationally renowned mock draft GM, Justin! Some of these guys getting picked today are first round talent and the teams scooping them up here are surely thanking the big Easter Bunny upstairs that they've fallen this far. We have highly qualified NFL experts who have each been assigned the role of temporary GM for several NFL teams and we will go through the first two rounds selecting the best players for our respective teams. While you follow along, I'd like to urge you to give us your feedback and please feel free to lobby for your respective team's GM to pick whatever player you feel is best suited to them. Here are the GMs for each team. The Niners have a whole lot of needs. The most glaring, obviously, is at quarterback, but something tells me that San Fran won't be pulling the trigger on Ricky Stanzi right now. San Francisco is one of those teams that is getting totally screwed by the current situation in the NFL, as they have a lot of needs to address in free agency. There are needs for a 3-4 DE and OLB here, and once again Jabaal Sheard makes a lot of sense here. With their outstanding nose tackle Aubrayo Franklin making it clear that he "has every expectation of cashing in" on the open market this offseason, the Niners need to find that space-eating nose tackle to replace him. At 6'3 and 334 pounds, Phil Taylor is absolutely massive, and he also has long arms (34 inches) and huge hands (10.75 inches) to contend with. While measurables don't mean everything, they sure go a long way with nose tackles, and this guy is your prototypical space-eater. He's got a bit of a reputation for being the last guy off the ball, but he also has the reputation for being completely immovable, so take the good with the bad there. Either way, this guy is going to take care of the middle of the defense all by himself, keeping bodies off the ferocious Patrick Willis. The Niners would do well to address the other defensive needs in this draft and try to find a quarterback in free agency (Vince Young and Donovan McNabb come to mind) to bridge the gap until next year, where they may be in position to reunite Harbaugh with his friend in Palo Alto. Enough! I can not let Sheard slide any lower than this. The Broncos 32nd ranked defense is getting a much needed upgrade under my watch. 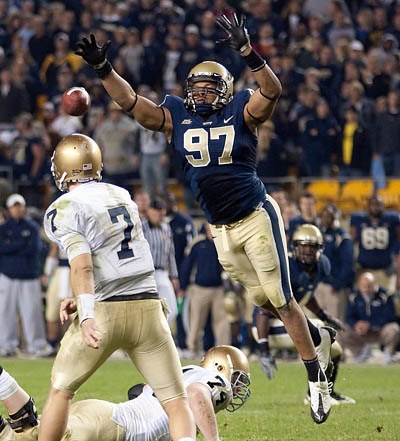 With selections of Marcell Dareus and Corey Liuget already, the Broncos continue to upgrade their sieve defensive line with the selection of the red-flagged All-American from Pitt, Jabaal Sheard. Sheard is a classic tweener who could potentially play either DE or OLB in the NFL. He's a little small at his current weight for DE, but has the potential to add some bulk without sacrificing much speed or agility. What he does have is explosiveness off the edge that will be very attractive to NFL scouts. And he looks like a natural for the rush linebacker position in a 3-4 set. It's more likely that the Broncos will choose to have him bulk up and be a DE, but in the switch to the 4-3, John Fox could certainly elect to bring Elvis Dumervil down to the line instead. Sheard was selected in this position over other DEs like Allen Bailey because he has the versatility to move around if he has to. The Broncos still have a lot of needs. Tight End would be the most likely upgrade on the offensive side, but it's probably a little early for that. Mikel LeShoure was also an option for an offensive need, but there are backs that make as much sense that can be taken later in the draft, like Kendall Hunter, DeMarco Murray, and Jordan Todman, to name a few. LeShoure does have the power that Denver needs, but it makes more sense to me to address the defensive line with these three early selections and just move on from there. John Elway has said that he wants four starters out of this draft, and these three choices would net him three starters right away. The Rams are seriously tempted here. Do they go for need or do they go for best player available? The division was theirs for the taking last year, but they didn't have enough weapons in place to defeat the Seahawks in the final week of the season. They have serious needs at wide receiver, both offensive and defensive tackle, outside linebacker, and strong safety. Receiver has been addressed with Julio Jones in the first round, and now they have to decide if they can rely on the Mark Clayton, Laurent Robinson, Danny Amendola, Danario Alexander, Mardy Gilyard pu-pu platter. 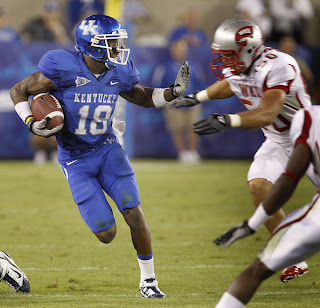 Randall Cobb of Kentucky looks like he'd supplant all those guys, and he would be a terrific complement to Julio Jones. Landing arguably two of the top three receivers in this draft would be a major upgrade for the crew that Sam Bradford somehow succeeded with last year. Roger Saffold and Jason Smith are two young OTs, so I think the Rams will choose to wait before addressing that position. There are still a few valuable DTs at this spot that can start right away. It's still probably a bit early for OLB and SS. On top of all that, the Rams are staring at Mikel LeShoure with such intensity that it is making everyone uncomfortable. With the guys available at other positions bringing some maturity issues (Marvin Austin, looking at you), the Rams are going to ignore their needs on defense for the moment and grab the versatile and exciting Cobb. Cobb was a jack-of-all-trades at Kentucky, lining up at WR, QB, and RB. He was the only player in the nation to rank first or second on his team in rushing, passing and receiving in 2010. Ideally he would find himself as a #2 WR or a slot guy, and with Jones already on board, that is the position he'll find himself in here. He doesn't have great speed, but he is incredibly smooth running routes and creates separation easily. He has outstanding body control and ball skills, and with his experience playing both WR and QB he knows how to get open. This is a high-IQ player who will be able to help out all over the field: he's a Percy Harvin type WR/RB that you can move all over in certain packages, he played QB in the "Wild Cobb" at Kentucky where he was a credible threat to throw the ball, and he is even capable of helping in the return game and on special teams. Last year he scored receiving, passing, rushing, and even returning punts; he also threw for a score on a fake field goal (he held for placekicks as well) and scored two-point conversions by receiving, passing, and rushing as well. Bradford is going to be pinching himself after lining up with Julio Jones and Randall Cobb. Because of the Seymour trade the Raiders don’t have a first round pick this year making their 2nd pick even that much more important. Oakland can go two directions with this pick and they both involve the run game. Even after spending the #8 pick last year on MLB Rolando McClain the Raiders still had one of the worst run defenses in the league. They could opt to try and solidify the middle of that defense, but I think they address that later in the draft. The Raiders bread and butter was the running game. They had one of the best in the league and look to continue that next year. Stefen Wisniewski plays with a mean streak and can play both Guard and Center. He would be a great addition to a Raiders O-Line that is desperately in need of help at both positions. #7(39) Tennessee - Christian Ponder, QB, Florida St.
#19(51) Tampa Bay - Justin! Stay tuned to SKOHRboard for more mock draft action every day until the NFL Draft kicks off on April 28th. Acquiring replica watches sale nevertheless remains a daunting activity to countless for the reason that alongside those a large number of brands of men's watches, there are many counterfeit brands that not a lot of have the ability to spot. You can find also leading brands like hublot replica and a lot of others that make it difficult for you to purchase but not due to lack of alternative. No matter the case tag heuer replica you will need one thing that will look very good on you after you put on it.The primary role of breitling replica as all of us know is show time but as of late replica watches are being created with other functions in order that they remain relevant within the ever altering market place. You'll find watches with features like calendars and alarms. You'll find also significantly complicated watches that offer rolex replica sale displays of time and are often put to use for athletes and other sport personalities for competitors and education purposes.